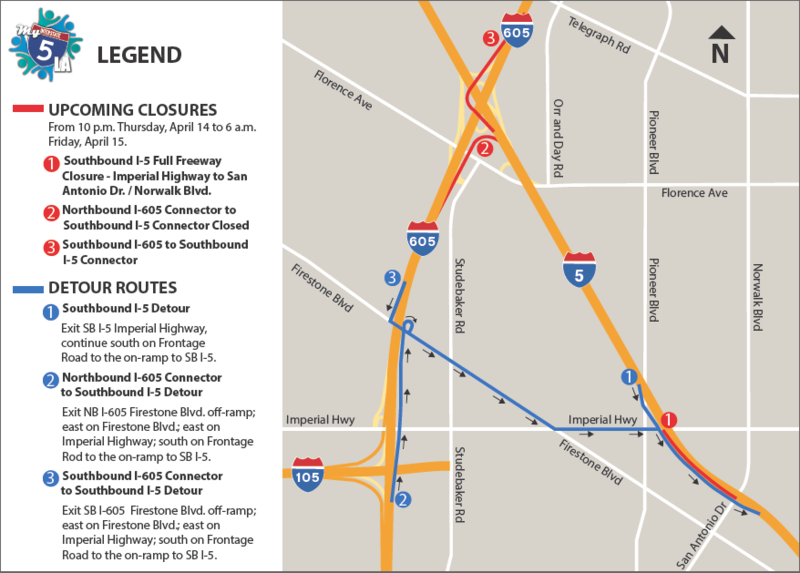 NORWALK – The California Department of Transportation (Caltrans) plans to close all southbound lanes of Interstate 5 between Imperial Highway and San Antonio Drive/Norwalk Boulevard, and the Interstate 605 connectors to southbound Interstate 5 beginning Thursday, April 14 at 10 p.m. and ending Friday, April 15 at 6 a.m. The closure will allow crews to move 12 new concrete girders into place that will provide the structural foundation for the new Pioneer Boulevard bridge. Southbound Interstate 5 – Exit at Imperial Highway off-ramp; continue south on Frontage Road to the on-ramp to southbound Interstate 5. Northbound Interstate 605 (To southbound Interstate 5) – Exit at Firestone Boulevard off-ramp; east on Firestone Boulevard; east on Imperial Highway; south on Frontage Road to the on-ramp to southbound Interstate 5. Southbound Interstate 605 (To southbound Interstate 5) – Continue on southbound Interstate 605 and exit at Firestone Boulevard off-ramp; east on Firestone Boulevard; east on Imperial Highway; south on Frontage Road to the on-ramp to southbound Interstate 5. The Santa Ana Freeway (Interstate 5) High Occupancy Vehicle (HOV), Imperial Highway/ Pioneer Boulevard Project extends from Silverbow Avenue to Orr and Day Road in the city of Norwalk. The project will widen nearly two miles of I-5 to add one carpool lane, and one general purpose lane in each direction. Go to my5la.com and QuickMap for more information. Please see the attached detour map.